General contractors know the drill. You’re on a jobsite; things are behind schedule (as usual). You need to know right now the status of a change order you placed. You call the subcontractor’s project manager. Voicemail. You call their right-hand person. Out to lunch. For better or worse, we check these devices every 4-6 minutes, and we expect access, answers, and action with just a swipe of the finger. This amazing, rapidly evolving technology is helping to reduce consumer friction at every turn, yet our industry still often works in terms of business days and weeks — and yes, sometimes even through fax! At American Direct, we have been working for years to bridge this technology gap — to connect online access with on-the-ground action — both internally with our associates and with our clients across the U.S. The foundation of this effort is ClientLINK, a virtual extension of our American Direct Project Management Team. ClientLINK is our “online project intelligence portal,” offering the data and responsiveness our clients need to ensure their projects run efficiently. We developed the tool several years ago as part of an internal process to enhance our project management infrastructure, but ultimately decided that ClientLINK would be of the greatest benefit to our clients if they could access directly. Now, all of our clients are offered total transparency into every facet of their American Direct projects. 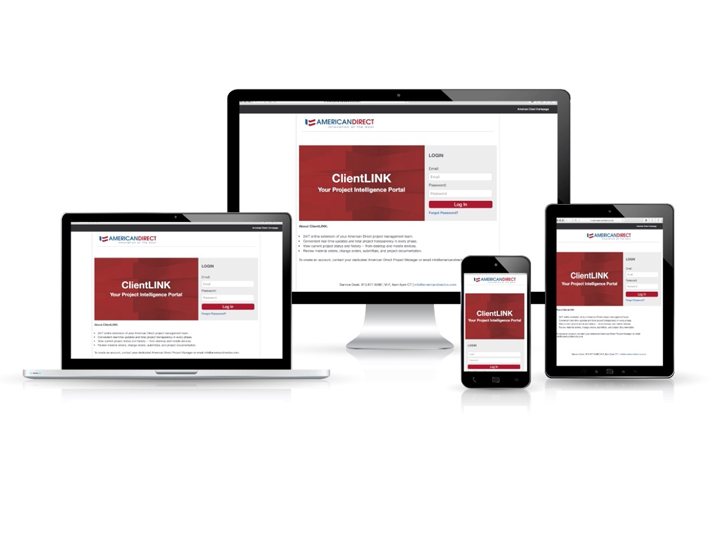 Available 24/7 from desktop or mobile, ClientLINK offers real-time updates, job history, information on material orders, change orders, submittals, shipping status, and project documentation. Initially, providing this behind-the-scenes access into our business came with some organizational anxiety, but ultimately, we knew this level of ongoing communication and data sharing would be critical to delivering the frictionless customer experience we’ve all come to expect in our daily lives. Just as important, ClientLINK holds our team accountable in providing exceptional customer service, and it empowers our valued clients with the tools and trust needed to build long-term, mutually beneficial relationships with American Direct. We hope you find ClientLINK to be a valuable tool in your work, and we encourage you to share your experience (good or bad) with us. Existing client? Contact your dedicated American Direct project manager to setup a free account. Want to learn more? Visit americandirectco.com/clientlink to watch a short video showing ClientLINK in action.